Back again! My CCT card in my earlier post did start out following the sketch over on Fri Sketchers but as it was oval and I had spare papers I thought I'd make another card for that with another WoJ. 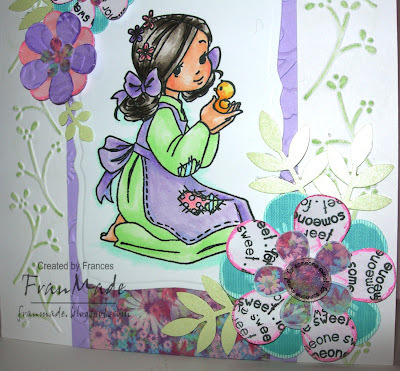 This is Willow with flowers and the papers/method are same as my CCT card(see post below), the paisley stamp around the image are from a laura ashley set, other bits from stash. Again most of the stash/details are as post below so won't list them. Stamped edges around image are from a Basic Grey flourish set, sentiment is WoJ too. Sorry about the poor photos it was nice and sunny yesterday so it's bleached out the colours a bit. 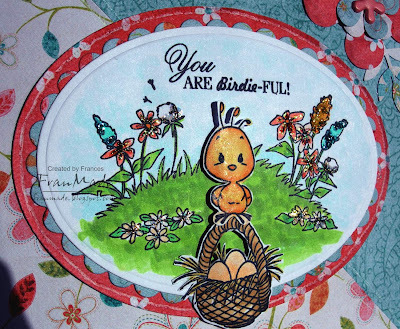 The close up isn't much better either and I wanted to show the sparkle on the birdie and the flowers . .
Colouring: Copics with twinkling H2O over the birdie and stickles on the flowers. Others: Oval nesties, EK retro flower punches, MS 'frond' leaf punch, brads and faux stitching with a perganamo piercing wheelie thing (don't know proper name sorry!) I've had for years which I run around the border to imitate stitching holes then I just draw stitches over it - in this case with white gel pen. Not as good as the real thing but it's the next best plus it's only the size of a pen and takes less time. Will be back later to post another WoJ card. Until then byeee! Happy Birthday Tilda & Friends! 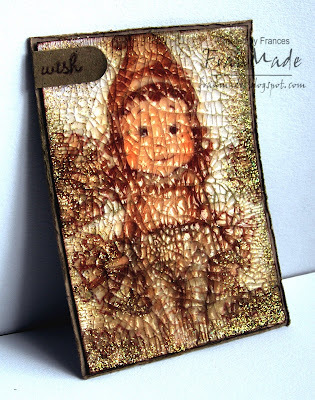 Yes, it's been 1 year since the very first ATC challenge over on Tilda & Friends! Can't quite believe it's been that long! So the theme this week is 'Birthdays' and if you join in this week you could win some stamps (Courtesy of High Hopes, via me as they very kindly let me keep duplicate order they sent out after my original one turned up!). 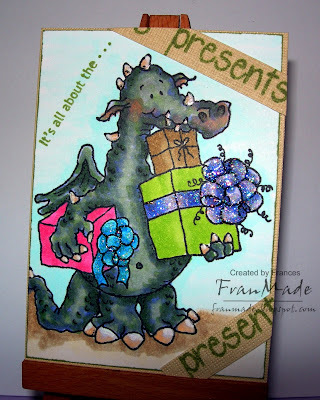 One of the stamps is 'Gavin the giving Dragon' which I have used on my ATC (yours will be new unmounted rubba of course! Other 2 are 'Abigail' and 'Albert's gift') For full details and to enter, pop on over to Tilda & Friends . I have coloured Gavin with Copics and lots of stickles on the bows. Matted onto beige card and the sentiment is from a CC Designs set which I have split up and stamped the 'presents' bit onto the left over strip of card and stuck on to look like ribbon around a present. That's it, pretty simple but I quite like it like that and it'll make a good tag or card topper. Hope you all have a good post day too! Just a quickie tonight, this was going to be for my ATC tomorrow but I made another one to go with a prize we will be offering (so you'll have to come back tomorrow to see that one) so thought I'd just post this tonight seeing as I've not finished my other card. 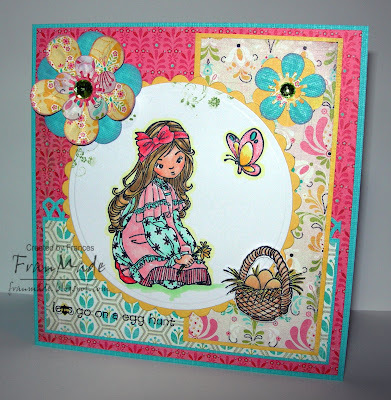 Images: 'Chick-a-dee' Sugar Nellie stamp. Just adore this one - her big eyes reminds me of the precious moments images. circular sentiment stamp came free with her and her friend. 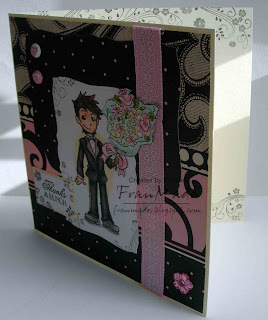 Others: have embossed the edges of the white cardblank with cuttlebug embossing strip and then swiped ink over it. Flowers made with EK retro flower punches and scrap card (stamped sentiment randomly over white card before punching flowers out). The centre of the large flower has a button I made with shrink plastic using the circular sentiment stamp - see below for close up of it. Leaves are also punches. That's all for tonight, have a good evening! O.K, something different for today which appeals to my silly sense of humour. . . .Yup, it's an egg! Although my colouring was a bit off, didn't have the right shades (hmm excuse for more copics I think!). He looks a bit dirty or like he could be a bad egg heehee (Hubby said he looked like a pebble the way I coloured him although it did make him laugh so we share the same humour). There's lots of other corny puns I could think up for him, like 'you crack me up' or 'egg-cellent', you did it!' 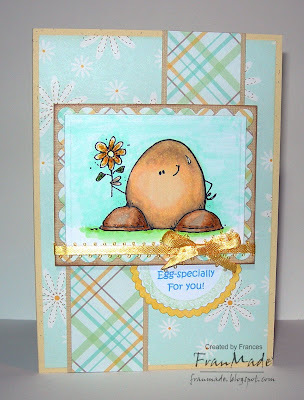 or 'egg-xtra special day', . . ooo I could go on he's such a versatile egg! 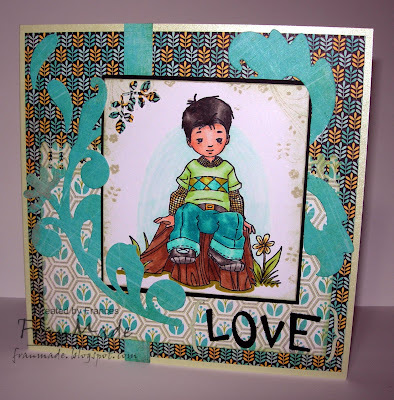 I've kept it simple so used the fab sketch over on Mojo Monday and picked out this paper to match the flower he's holding(DCWV spring stack from last year). Coloured with copics and a bit of stickles on the flower and glazed his shoes. Printed the sentiment off PC and just added a bit of ribbon. 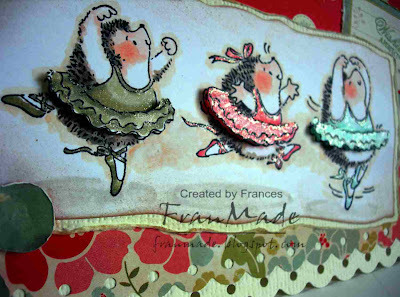 Hope you don't mind but it's another WoJ stamp :) can't help it, they are all just so cute. 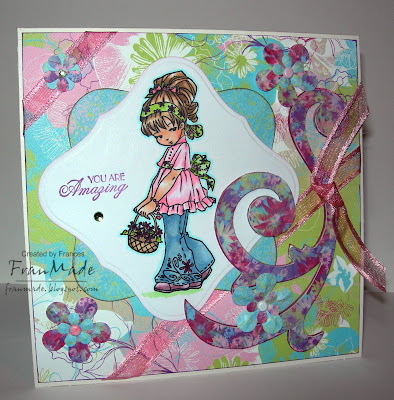 This one is using the sketch over on Sketch Sat and it's turned out ultra girly so may not be to everyone's taste! Seems a bit soon to be making easter cards but I can't believe we're nearly 2/3rds way through Feb already so it can't be far off, can it! Have a good day! I'll try and make my next card a non WoJ before you all get bored o.k?! 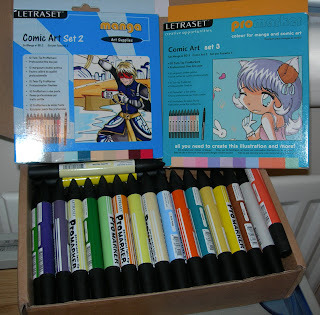 As I've got hooked on copics now, I haven't been using my Promarkers so have decided to sell them. Anyone interested? Would like to sell the lot as 1 package so maybe you and some friends would like to split it? Paypal & UK only (as quite heavy). Don't forget to check out the rest of the DT's creations over on CCT. Thanks for dropping by and for all your lovely comments. Have a good day. Others: Quickcutz damask flourish die, sizzix alpha strip die for the 'love' can't remember the name of it off the top of my head, MS fench border punch and the little leaves in the corner are from a small 'Leone Em' punch I found whilst clearing out the other week - didn't even know I had it :/! 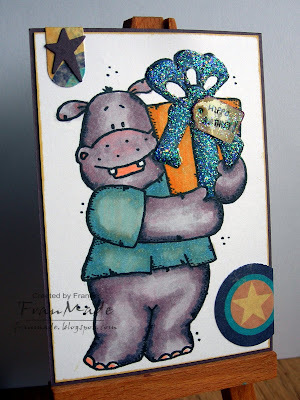 That's all for today, will have another cutie from the set for my CCT card tomorrow - hope to see you then. Off for some lunch then it's work for me tonight. I've stamped cute sitting Alva, masked her then stamped the flower for her to sit one plus a few surrounding her in brown memento ink then just coloured her to death in brown copics :D.
Could have left it there but then wanted to try the crackle accent glaze over it to give it a distressed enamel effect (took forever to cover!) then added bits of gold glamour dust around the edges before it dried. Only after it dried did I see the extent of how it cracked!! A tad more than I'd anticipated but it couldn't be undone! It was hard to capture the glaze and glitter in the top photo but when I did capture the glaze, the colours looked too dark as you can see for yourself in the photo below . . .
Hope you like my little experiment. 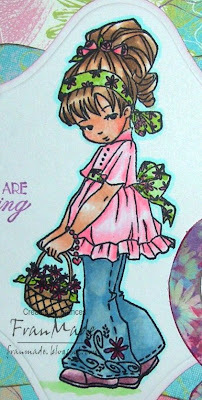 I'll be back later with another WoJ spring stamp kit card. Yep, it's official - all the WoJ spring stamp kits have been shipped and have already landed on doorsteps as we speak so start stalking your postie :) If you didn't order the kit but now wish you did !, individual stamps will be available to buy at the end of this week. O.K back to my card. 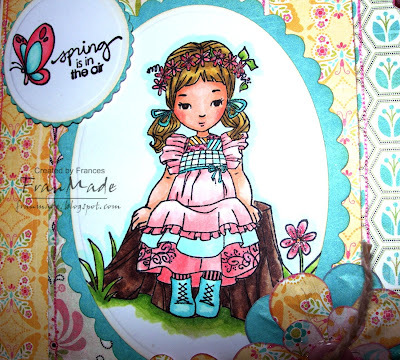 I've used the sketch over on Friday sketchers and the recipe over on WoJ challenge (3 papers, 2 flowers, 1 button/brad) and 3 of the stamps from the kit (girl, plus 2 of the accessory stamps - the tree trunk & the lil butterfly). I've stamped the girl then masked her before stamping the tree trunk for her to sit on :) The sentiment next to the butterfly is from one of those studio g mini sets. All coloured with Copics then a touch of Sakura stardust pens on the flowers and butterfly for a bit of sparkle. The 2 flowers have been made with EK's retro flower punches which I have layered and added a button to the larger one and a little gem to the smaller one. 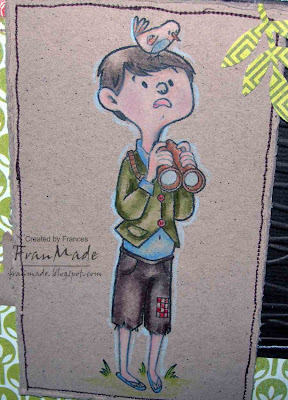 Papers are BG Urban Prairie - think it's perfect for these stamps. Don't forget to visit all the other DT's to see more of these cuties (links in my sidebar). Thanks for visiting - have a good day. 'It's all good' . . but a bit late! Here's the card I said I might be back to show. It was for the High Hopes challenge sketch by Katharina but as usual, I'm too late and a new challenge is up now but I had fun :) Wasn't sure what colours dragons should be (who does haha. Hubby has since come up with some fab suggestions so will try those next time), so it was a stab in the dark and I'm really happy how he's turned out - just hope I can do it again! 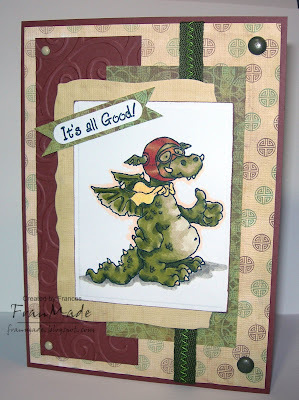 Love this dragon, think he's a great 'dude' card :D so I've kept it simple and just added a couple of brads and a fairly masculine bit of ribbon! 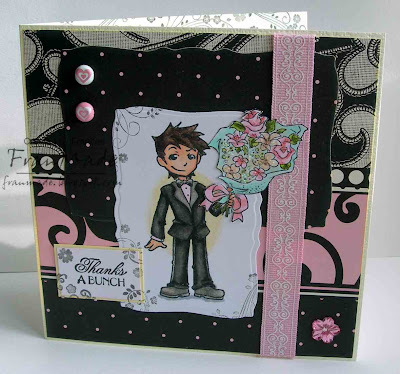 Used the scraps for the inside of the card too, nothing fancy, just layered blocks to compliment the front. Thanks for popping by and have a great evening. 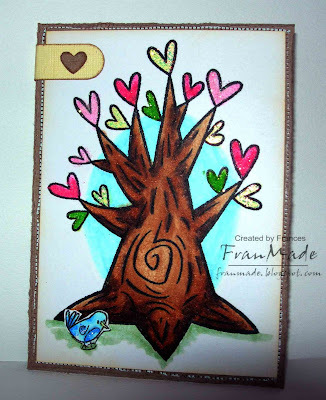 Just a quick post today to wish you all a Happy Valentine's day :) I've not used my Magnolia stamps for a while now so had to rectify that with this cutie for this week's Magnolia/stampevie challenge. Not that happy with it but that's what happens when I try to rush it and finish a card quick! 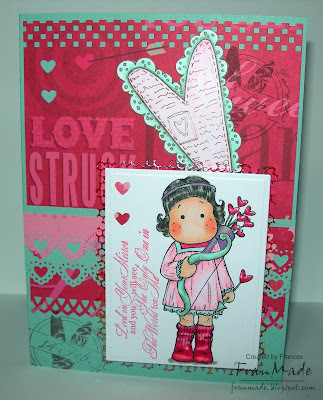 I've just ordered the new Miss Anya stamp set from The greeting farm (just love them!) and am looking forward to seeing the new High Hopes being released tomorrow. All this means I'm actually debating whether to get the Magnolia spring kit or not . . . got till tomorrow to decide . . desisions, decisions?!!! Have a lovely evening/weekend. May be back later tonight/tomorrow if I finish my High Hopes challenge card in time! Been meaning to use these cute 'Sherbet' stamps from Pollycraft since I got them on their release but that was nearly 2 weeks ago now! I just couldn't resist those big eyes and they looked like fun to colour in (which it was ;) ). This one comes with 3 seperate sentiments for you to stamp onto the card she's holding. I've used the fab sketch over at Sketch Sat to whip this one up (I say whip, but it still takes me far too long finalising a card. It kinda sits on my desk whilst I keep going back to it, fiddling until I think it looks o.k to all stick down. . anyone else like that?!) I've decorated the inside too with the scraps left over but didn't think it was exciting enough to share! I wouldn't normally team orange with pink but I just went with the colours on the paper (which is sheet from an old DCWV teen stack) and I quite like how it turned out. Really simple card so don't think I need to list anything and I've used my Copics to colour and some galaxy markers for the doodling on the edges. 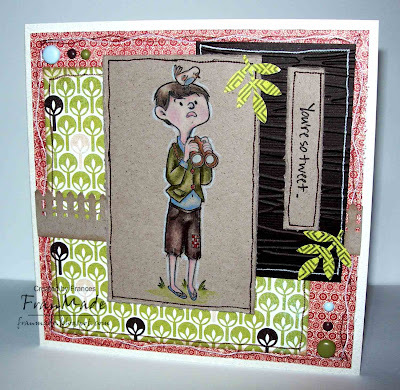 Don't forget it's the Whiff of Joy new release tonight (Medievel range by Alison Acton) - My DT packet must be stuck in the snow backlog somewhere :( but if you wanna see some gorgeous cards made with them pop over to the WOJ gallery where the rest of the DT have outdone themselves again! I'm off to work now but have a good evening and try not to overspend as I know there are LOTS of fabulous rubba releases this weekend that would make your bank manager cry LOL! 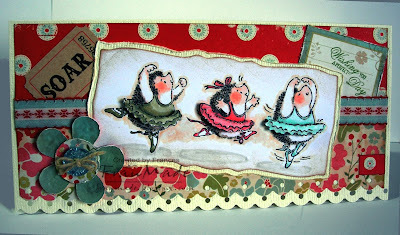 CCT theme this week is 'music & dance' so thought I'd give this cute PB stamp an airing and made a long DL sized card for a change. 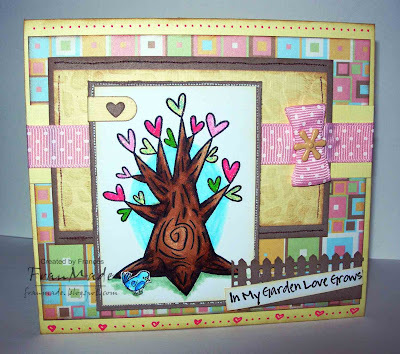 Others: mega rectangle nesties, Heidi swapp distresser, chalk ink around edges for aged look and to tone down the white cardstock of the image, fiskars border punch for edge of card. Retro flower punch with a circle, button and string for the flower and a tim holtz 'soar ticket from the 'adage' set plus some ribbon along the middle. Thanks for stopping by & have a good Thursday. Others: Martha stewart fence punch (can you tell I love this punch! ), embossing on the yellow piece behind the tree (thought it looked like cobblestone path), distresser tool around the edges, lots of faux stitching, ribbon and brad and a bit of doodling to finish. Thanks for stopping by. 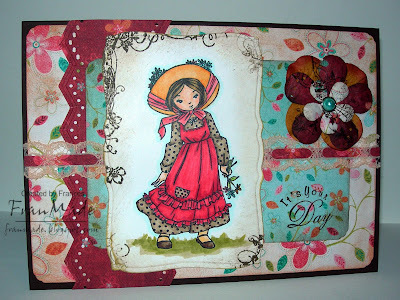 I'm off to finish my CCT card for tomorrow then a quick blog hop/catch up before work later. (Still waiting for my post too . . grrr why is it, it is always so late when you are expecting something?!) Have a good evening. Oops, so much for posting again this morning, sorry! You've probably seen/heard the news that WoJ will have a new 'Charlie & Charlotte' release on the 14th (this Sat) from Alison Acton. 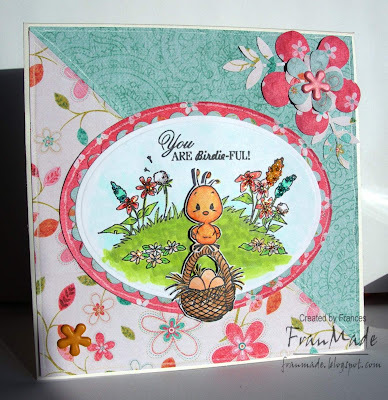 It's a super cute mediveal theme and you can read all about it on Katharina's blog (also fab chance to win the whole set). Some of my fellow DT have already received their stamps so lots of sneek peeks to whet your appetite in the gallery and on their blogs (links in my sidebar). Just don't leave until you've seen my card though will you?! Others: mega curved rectangle nesties, matching DCWV ribbon, brads and flower gem to finish. Ooo, really like how this turned out, really girly after my last few. Think he looks really dapper standing there offering a bunch of flowers - definately be using this combo again! I had this card all laid out ready to stick down on my desk when I discovered it was almost identical to the new Ismaki sketch which was posted today. So I re-arranged it slightly (flipped the sketch to work with) and voila, challenge complete :) - love it when that happens (which isn't very often!). 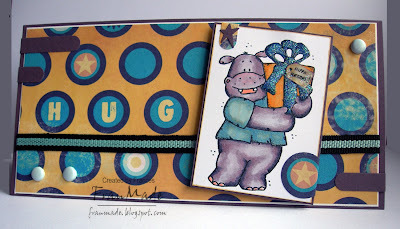 I've also used different ranges of BG papers and brads so can enter it into the BG challenge too - yeah! Sorry the last few have been the same colour palette but you know when you've got everything out and you're on a roll, it's best not to fight it! I'll be back in the morning with another card which will be less masculine, promise plus some WoJ news. Loved the sketch over on Fri sketchers this week (thanks Claudia!) - nice and simple but effective, so managed to put this together really quickly. I had to get this lil fella as soon as I saw him a couple of weeks ago - he's one of the new Whipper snapper spring/summer releases. I've always loved their stamps but found them a bit expensive in the past, not to mention I'm seriously lacking in storage space for wooden blocks. However they have started offering all their stamps as either unmounted or cling mounted too now, which was like music to my ears . . . so needless to say a few of these babies winged their way over last week and I've already got Kathy spending too (heehee). I'm just trying to be very good and not go back for more which was very tempting after seeing the 2 Kathy made with hers! Not much to this card as I thought the image was cute enough (coloured with copics). 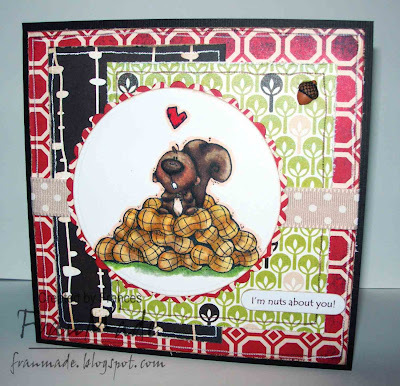 Papers are BG 'offbeat', with faux stitching around the edges, circle nesties to cut image out, some ribbon and a cute acorn button I found in my stash, sentiment printed off pc (I love corny puns) and punched out with SU word window punch. Have a good evening, thanks for stopping by. 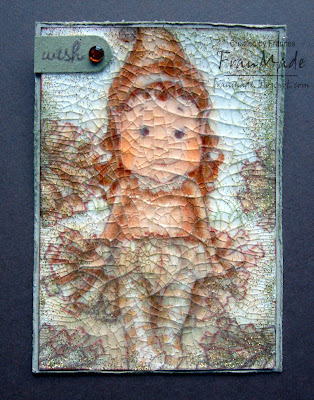 Tilda & Friends ATC: warm it up!